He estado mirando una compañía australiana de ciencias de la salud. Me parece muy interesante y quiero entrar esta noche. Están a punto de publicar el cuarto trimestre. En principio la veo bien para el medio y largo plazo. Llevan años creciendo por la diversificación, expansión y adquisiciones de otras empresas relacionadas con el sector. El sector salud sufre buen crecimiento en Austalia y Nueva Zelanda. Ellos llevan desde ropa y utilidades para hospitales, hasta material quirúrgico, ecógrafos, oftalmología, etc. Gran variedad de productos. - Revenue up 190% to 93.4M. - Net Profit after tax of $7.5M up 257% over the prior year. - Earnings per share of 5.6 cents, up 75%. financial year as investors continued to embrace our story. 1.4 cents in the prior year. gives the company a wider access to capital as it grows. Los ratios financieros me parecen buenos, per aún bajo para el crecimiento esperado, deuda controlada, roe roa bien, etc. En su web viene todo más detallado, todos los balances de los últimos años, buen crecimiento por acción. He aprovechado las rebajas para comprar. Ha publicado resultados, son buenos, pero ha bajado un 11%, pienso que es porque se esperaban mejores, los anteriores fueron espectaculares, Pero a estos precios me parece interesante, por lo menos para mí. Esta se va para abajo, sin fallo, ha roto la resis sin volumen, y ahora nube oscura. si claro y mañana, lloverá por Madrid? Me parece una empresa en crecimiento para los próximos años y con gran potencial. Sector interesante y lleva unos años mejorando los resultados, la acción ha pasado de 0.2 a 0.8 dólar en los últimos años por mejora de resultados y buenas perspectivas. What Investors Should Know About Paragon Care Limited’s (ASX:PGC) Financial Strength? Paragon Care Limited (ASX:PGC) is a small-cap-stock with a market capitalization of USD $87 Million. While investors primarily focus on the growth potential and competitive landscape of the small-cap companies, they end up ignoring a key aspect, which could be the biggest threat to its existence: its financial health. There are always disruptions which destabilize and many a times end an existing industry, and most small-cap companies are the first casualties when such a wave hits. Apart from geopolitical events such as political unrest and natural calamities, a company which is suddenly facing a hostile market environment must be able to fulfil short-term commitments with its reserves so that it can see another day. Thus, it becomes utmost important for an investor to test a company’s resilience for such contingencies. In simple terms, I believe these three small calculations tell most of the story you need to know. Does PGC generate enough cash through operations to meet all its needs? More than the revenue shown on paper, what matters is how much cash is generated through operations and whether it is enough to continue operations, meet debt-obligations and fund growth. Over the past year, Paragon Care’s operating cash flows stood at 21.6% of its overall debt. That means Paragon Care’s core operations are generating enough cash to comfortably service its debt. Does PGC’s cash and short-term assets cover its short-term commitments? While failure to manage cash has been one of the major reasons behind the demise of a lot of small businesses, the mismanagement comes into the limelight during tough situations such as economic recession, war, natural disaster, sudden increase in the price of raw materials, and a supply chain risk, which can put a company in a difficult situation. However, banks, creditors, wages, and commitment to suppliers do not go away even during an extreme event. So, a company must maintain enough liquidity to meet its short-term obligations to survive. Paragon Care is able to meet its short term (1 year) commitments with its holdings of cash and other short term assets. Can PGC service its debt comfortably? While ideally I reckon the debt-to equity ratio of a financially healthy company to be less than 40%, several factors such as industry life-cycle and economic conditions can result in a company raising a significant amount of debt. For Paragon Care, the debt to equity ratio is 47.8% and this indicates that Paragon Care’s debt is at an acceptable level. No matter how high is the debt, if a company can easily cover the interest payments, it’s considered to be making a good use of that excessive leverage. To keep an eye on how it’s doing on that front, an investor can check how easily the company can service its debt. If it earns at least 5x or more of its interest payments, that’s an indication of financial strength. In PGC’s case the interest on debt is well covered by earnings (7.3x coverage). Whilst Paragon Care’s debt to equity ratio is high for my liking, it’s interest costs are well covered by it’s net income and the company’s operating cash flows are strong enough to fuel it’s future growth activities or pay dividends. Overall it’s in a strong financial position. PGC’s recent acquisitions (predominantly consumables and service businesses) have been performing better than recognised (see page 5), which has significant implications for the growth it is likely to deliver in the future both from its current businesses and the acquisitions that are clearly going to be made. The long term growth we expect sets it apart from comparative companies with similar health related product offerings and makes us think more about the way in which GUD has recently been re-rated in response to its acquisition/divestment program. We believe, based on PGC’s register and limited broker coverage that mainstream investors are yet to consider this and that PGC is essentially undiscovered. Our 12 month TP is $0.95, however with acquisitions we will look to reassess our TP again. BUY. Another strong year for Paragon, with improvements in performance across most important metrics, including net debt, inventory turnover, and margins. 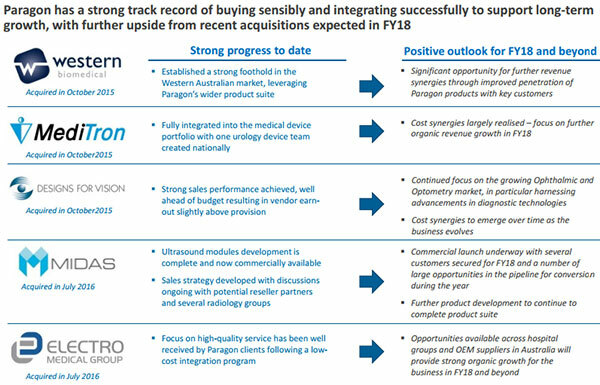 Paragon hit its target range of between 5-6 times inventory turnover for the first time this year, reflecting improving sales that is reflected in earnings. Likewise, earnings before interest, tax, depreciation and amortisation (EBITDA) margins improved from 13% to 14.6%, just below management’s target of 15%. Revenue of $117 million is well shy of management’s $250 million target. This means that Paragon appears to have plenty of room to grow revenues, although it may not be able to generate much more profit per $1 of sales. As a result, revenue growth could become one of the more important indicators of the company’s growth in the future. 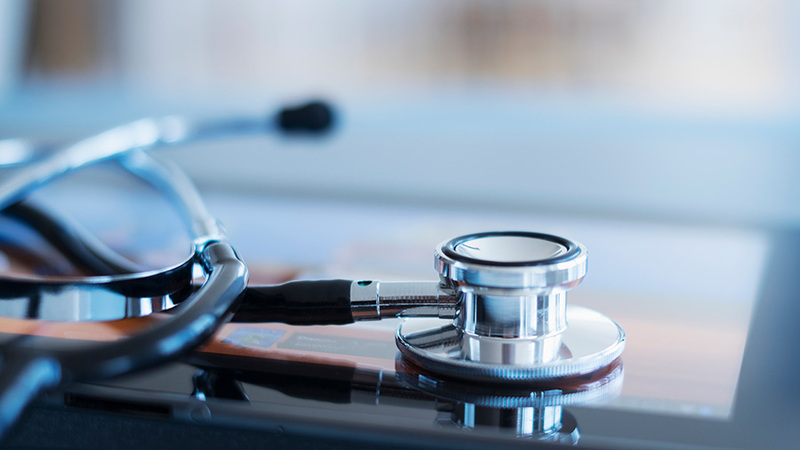 Nuevo tiróncito y se pone en 93 c.
Shares in healthcare equipment group, Paragon Care (ASX: PGC) spiked from Friday’s close of 81 cents to hit an intraday high of 93 cents on Monday. This occurred under the highest daily volumes recorded in the last five years. The intraday high was repeated again on Tuesday. Interestingly, the provider of medical equipment, devices and consumables to the health care industry has traded as high as 94 cents during its circa 10 year history as an ASX listed entity, and it could be technical selling that is currently keeping a lid on the company’s share price. Certainly, the result appeared to warrant a rerating as the impressive key financials below indicate. While revenues were broadly in line with management’s guidance, there was a slight outperformance at the EBITDA line. As indicated by John Hester from Bell Potter, PGC is best assessed on its earnings per share performance. As a growth by acquisition story, the company has issued new shares over the last two years, effectively diluting earnings per share. Consequently, using this measure takes into account the impact of issuing scrip for all or part consideration in relation to acquisitions. Bell Potter is forecasting earnings per share to increase to 6.9 cents in fiscal 2018, implying a PE multiple of 13.4 relative to its 12 month high of 93 cents. This represents a 50% discount to the broader sector average PE multiple of 26.8. However, some of the larger blue-chip companies tend to push the average multiple higher than what is normally representative of the mid-tier players. The broker reactions have been interesting with Bell Potter maintaining its buy recommendation and slightly increasing its price target to $1.02. By contrast, Ian Christie from Argonaut views the current price as good value with his valuation of $1.12 implying upside of 20% to the group’s current trading range. He expects PGC to achieve organic growth of 10% per annum over the next two years with EBITDA margins of circa 15%. Again, broker projections should only be taken into account with all publically available information. PGC’s Managing Director, Mark Simari was relatively upbeat with his outlook statement, saying that the company is well-placed to deliver growth in future years, driven by a combination of organic and acquisitive growth with the e-health sector offering a new revenue stream. The addition of services and maintenance contracts will also help, as they provide recurring income to complement revenues generated from the sale of new equipment. Video de análisis de la compañía. Yo le veo crecimiento en los próximos años. Mientras la vea con este crecimiento, la mantendré.